Our experiments suggest adding the water and spinach first. We also quarter apples so that the smaller pieces get blended faster (and the big apple doesn't get stuck in the container with the Vitamix blade cutting a line through it). 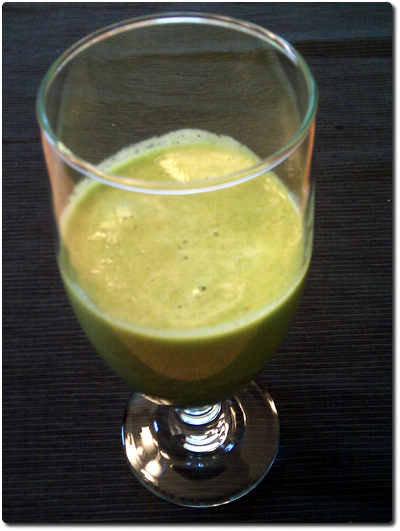 The apple adds a nice sweetness, and the ice tends to reduce the fluffy foaminess of the spinach. This is very pleasant and suitable for breakfast on the go. Be sure to clean your blender quickly though, as the result tends to cake on the sides of the container more than most other smoothie recipes.